Last night usual run to the station, got off in the city to find freezing horrible rain. Shala all locked up when we arrived, no sign of anyone, 10 wet yogis standing out in the cold rain. A bit late but the doors were opened and in we went. Room was cold, did not start to get warm properly until the seated asanas. Hamstrings, legs very tight in standing postures, Trikonasanas were not as open as they can be. Prasarita Padott’s were not too bad. The whole room had a wobble on during Utita Padangusthasana. Very close to a domino effect falling over! Seated again hammies not really as pliable and warm doing Paschimottanasana, theough by the time we got to Janusirsasana A & B it was getting better, though C was never going to happen. Same with the Mari’s, A,B & C were there, bound and happy, but D was never on the cards. Bujapidasana was ok and Easter gave me a great adjustment in Kurmasana, she has a knack of knowing how much pressure to apply, I love it when space appears and the body moves into it. Usual leg crash in the middle of the room as we all came up from Supta Konasana. Surprisingly good Urdva Dhanurasana, probably because my mat was not slippy from sweat. Rest of closing was OK, including a really steady Sirsasana for a change. Closing Mangala mantra by call and response, i love that chant, I used to love it because it meant and end to those two hard, challenging hours, now I love it for its own sake as it brings us all together, not that practice has become any easier these days, but my breath takes me through it. We were running really late now, so only I am sorry to say a 5 minute Savasana, before literally having to sprint up the road to catch the train home, can do without having to run after practice. Home and I has safely made it from her home in the frozen north. Good to see her and catch up. 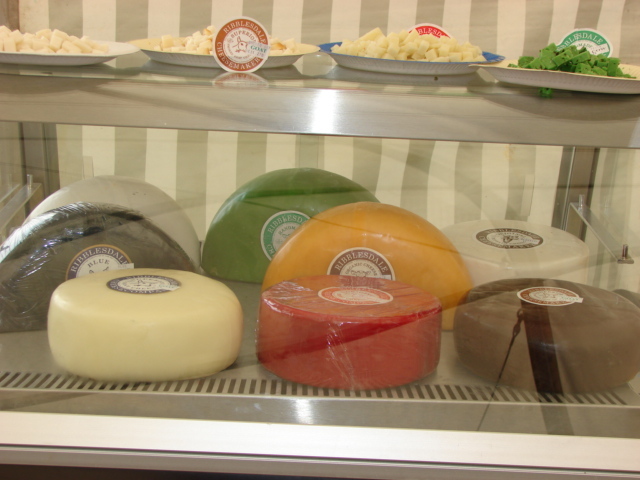 Today we went to the food fair, she was exhibiting her cheeses, see picture. Hard work on the legs standing talking to the public for a 8 hours. Have to say I loved the chocolate stand best of all, yum! We did the £2million for the month, we just had a mini party to celebrate, I am stuffed with chocolate biscuits, sweets and cakes. Am sure practice is now gonna be haaaaard! Had a rest on Wednesday, but back on the mat last night, up to Navasana, then some backbend openers before UD and the rest of the closing sequence. I seem to need a rest day after 3 or 4 consecutive days of practice, otherwise by day 5 practice goes to pot as I seem to quickly lose energy and motivation. Counted practice this evening to look forward to after a manically horrible week at work, 8 booked already, there’s a wonderful energy in that small room once we begin. I must make the most of it with I coming down to visit for the weekend, hopefully will get to practice again Sunday night, as just been reminded by Mind Bending’s blog that Monday is Moon day. My stomach has had a bad few days as well, a combination no doubt of work stress, I seem to hold all tension in my abdomen and all the biscuits I have had with my tea to get me through the stress, one bad thing leads to another, am just glad I don’t smoke or drink. This time next week I will be in Valencia, it cant come soon enough. A link between UD & IBS??? I am seriously beginning to wonder if there is a link between my stomach problems and backbends. Last night’s practice included Bekasana, Dhanurasana, Ustrasana as well as the usual Urdhva Dhanurasana. All obviously involve opening up the front of the body much more than usual, stretching the stomach muscles and opening the chest. This morning after feeling OK when I woke up, I now have a painful stomach and no doubt 2 days of IBS to endure. All I had for breakfast was toast, granola and tea, I can’t believe the brekky I have every day has brought this on. Tuesday night, so off to the Town Hall, a bright sunny evening. C had us do all the standing postures, and glad to say she actually adjusted me in Prasarita Padottanasana C, as Easter did last Friday night, again way over as my shoulders are finding room to move little by little. Also managed to keep the legs engaged and come up on my own without pitching forward. Seated postures with some instruction tonight, found I could almost jump into Triang Mukha from Downward dog, which is new for me, but cannot get my head, never mind arms and legs around, through, whatever, jumping from Triang Mukha back into the vinyasa. We only did Janusirsasana A, before heading to Marichyasana’s A & C, missing out B & D, grumble,grumble, grrrr. After Navasana x 3 C decided to delve into some second series, Bekasana, Dhanurasana and Ustrasana, with a full vinyasa inbetween. Then she had the whole class watch as I was used to demonstrate a backbend opener involving laying flat as if for UD, but with my feet together, then bending to get the top of the head on the floor, before arranging my hands around my head as is for headstand, the object being to get my elbows flat to the floor and back up. She then had me repeat, but with legs usual hip width. I did manage it once I worked out where everything went I am glad to say, but its coming to something when she uses me to demonstrate backbends! Though I have to say my following Urdva Dhanurasanas were great, straight arms easily lifting me, feet ok until they slid out on the damp mat, up again into a solid posture, have not done one this good since Bali with DK watching over me. So although we missed a lot out tonight, I actually felt I got something out of the class, rather than just treating it as training for Friday, for which I am happy to say there are now 4 booked. Though I really need to get a thicker mat for Friday’s, the floor at the new place is a hell of a lot less giving than the “L” shaped room. I have a “Tapas Ultra” 6mm thick mat at home, but it just turns into a skidpan doing an ashtanga practice and would be downright dangerous by the time I got to postures like Setu Bandasana and Urdva Dhanurasana on a Friday night, so if anyone out there can recommend a thicker mat that is absorbent, ie will give me grip at both ends of practice and is available in the UK please let me know. A long two hour practice this afternoon, it was really slow, but really good, I didn’t dawdle, but just took longer in the postures. I needed to undo slowly, my body felt a bit stiff after practising the last two days, but once the muscles warmed it was easy to keep going. Sometimes when I am slow it leads to me stopping, but not today. Parsvottanasana was the problem today, prayer position hands behind my back and a sudden excruciating pain in my left elbow, a kind of tennis elbow thing I think, where has this come from. But it was OK when doing the rest of practice, vinyasas and the odd handstand, so it must be to do with twisting the arms. An article in one of the Sunday’s struck a cord with me today, it was about people who are experiencing “Burn out” and at a younger age than before, also it is no longer the preserve of high fliers like Lawyers etc, it can affect anyone in a job they dislike, that is stressful and gives them little or no satisfaction. It manifests itself in depression, low self esteem, constant tiredness, illnesses such as stomach problems. Apart from changing jobs or taking a sabatical, one of the suggestions to help combat the problem before it is too late was yoga and meditation, so at least I am doing something right! Finally came to a decision about the Easter weekend, Valencia is more expensive, but there is plenty to do and see there and with luck it will be warm, so off to Spain I go. The Valencia tourist information website is one of the best I have seen as well, with loads of useful information. In the mean time it was back on my mat, after the great practice on Friday night, I wanted to practice. It’s those tiny little successes that give new impetus to my “Home alone” practice, a nice slow practice, taking care to breathe, did all the standing and up to Upavistha Konasana, before closing. Even managed to bind myself in Mari D with left foot in Lotus 🙂 , the other side was nearly there but not quite, its the tops of my feet that are now hurting. After my Urdva Dhanurasanas, I did the standing dropbacks described in another blog, whose www I cannot rememer just now, but it was described as standing, feet hip distance, hands supporting lower back, tail bone out, then lean back into the hands, was really surprised how far I got, think this one has some mileage, will try it again. Eventually as ever the phone rang, but at least I had spent 90 minutes doing practice on what is technically the Ashtanga day off. With a working life Saturday is for me an Ashtanga day, because I actually have time for my practice as is Sunday. I dont think it matters which 6 days you do, so long as you do. Hooray it’s Friday night. Despite having a fragile stomach, its off to Balham and the best practice of the week. Its a cold evening once the sun has gone, but the room is warm and welcoming as usual, grab my usual place, two along from the radiator and start to warm up. We are starting to get a regular group on a Friday and just like at the old “L” shaped room everyone is gradually finding their “Spot” in the room, good to see a couple of new yogis as well, swelling our number and hopefully making sure they have a good reason to never cancel this practice again. I just knew tonight was going to be good, you know when you can feel the energy in the room. After the Surya A’s I felt my body be open and comfortable, not struggling as the B’s had a flow of their own, my mind was still wandering though until the postures began, then it “clicked in” and my practice became a joy, it just didn’t seem to take anything like as much effort to do the asanas, Padahastasana was deep, my hamstrings were not yelling. Flowed through to the Prasarita Padotanasanas, C was incredible (for me), I was already way over when Easter came and adjusted me even further, much further than I have ever been before, I could not come up again and pitched forward, but actually going that far felt great. The balances were better than of late, the manic wobbler in front of me was a bit of a distraction though, they wobbled and did all kind of contortions before finding balance. Seated came round oh so fast, again the postures felt open, full jump through vinyasas between sides and postures as you would expect. My hips were fairly open, I first realised this in Ardha Badha, although I could not grab my toe, I was in Lotus without stress to either knee or hip. Mari A, B & C were good, but in my eyes this went from being a good practice to an absolutley fantastic one, when Easter adjusted me into a bound Marichyasana D on both sides. OK I know I did it with help, but I did it and it felt great and it gives me hope that in time I will again manage it on my own. Though I have to say my ankles and feet will not be too happy at the prospect, as they are now quite sore as I sit and type. Badha Konasana was good, knees on the floor without having to try, we all came up and over in a synchronised Supta Konasana, holding for that split second in mid air before landing and avoiding the mass leg, foot pile up in the middle of the room! Into closing before we knew it, practice just flew by tonight, 3 x Urdva Dhanurasana, though they were not that good as my feet kept sliding on my sweaty mat. I quite like the rest of the closing sequence, my favourite Salamba Sarvangasana, Halasana, Karnapidasana sequence and even did a reasonable Sirsasana tonight. Amazingly after just one and three quarter hours we were done including Savasana, that was a really quick practice, there was just so much good energy there tonight. It was a joy, how else can I describe it, fantastic, brilliant, great, wonderful 🙂 And Many Happy Returns to Easter for tomorrow. On the bank holiday escape front it has come down to a choice of three places, that is if there are any spaces left by the time I actually decide, we have Riga in Latvia, potentially a bit chilly, but very different, Valencia and Palma where it should be warmer but more expensive. Where does a Philistine go on vacation at Easter? Having searched for some Easter yoga, no luck, am now trying to find an escape for the 4 day holiday, Travelocity, Expedia etc, but nothing seems to float my boat. Ok where does the Philistine reference come in you may be thinking, well a few Easter’s ago I was doing yoga in Spain with LL. One afternoon a couple of Irish girls and LL were talking about the meaning of Easter and what it means to them, LL’s father is in the Church. Now LL know’s my leanings, football is the nearest thing I have to a religion, though Ashtanga seems to have taken over since. After some discussion LL piped up and asked “K , what does Easter mean to you?” to which I replied “Chocolate eggs!”, in the background I could hear an Irish accent saying “Philistine”. So I am in need of some inspiration, yoga would be good, but sunshine and culture would be nicer. My Concise book of the moving body arrived yesterday, my attempt at a bit of cramming before the YogAnatomy workshop. I now know where the Psoas is, what its attached to and what it does. So after all these years of teachers talking about it, it now makes some kind of sense. Not wishing to cram my head with too much at the first go I put the book down and got on my mat, doing standing up to Utita Padangusthasana. This is definitely a mental posture, I can do it at home, where there are no wobblers around me and I can focus on something near, even doing head to knee on a good day. Backbends were strange, I did some Ustrasana’s and walking hands down the wall before trying to push up from the floor in Urdva Dhanurasana, it would not happen, my arms refused. Did a couple of easy bridges, then tried again and up I went, but rather than try going up and down I just stayed there for a few extra breaths. Snow this morning, alas not enough for a “snow day”.